To attend a progressive dinner at The Botanical, Circa the Prince and Interlude would present a variety of hindrances, not least being the awkward distances to travel between the three restaurants. Taste of Melbourne presented the opportunity to achieve just that, with no further impediment than navigating a crowd of foodies (some of whom I think were only moonlighting as food buffs) within the finite and fantastic surrounds of the Royal Exhibition Building. The Taste Festival comes to Melbourne via London, having spread its wings through several cities in the UK, to Johannesburg, and landing in Amsterdam, Brussels, Melbourne and Sydney in 2008. 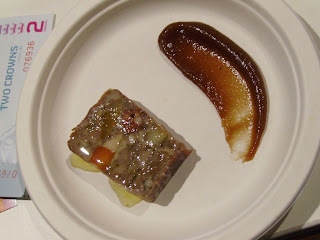 On paper, the setup distinguishes it from other, more familiar food festivals: a select range of restaurants offer three signature dishes, in reduced portions. The Festival operates its own currency of Crowns - $1 buys one Crown, and most of the dishes are between eight and ten Crowns. A $50 ticket gets you the $30 entry fee, plus thirty Crowns - a saving of five dollars. Therein lies another distinction - it's not the cheapest food event on the calendar! Once inside though, things became a little more familiar. Just as one would expect at the Good Food and Wine Festival, or any number of events at Fed Sq, the festival space was filled with exhibitors offering samples of their produce, so the fiscally savvy visitor could easily garner three reduced-sized dishes with their thirty Crowns and satisfy any residual hunger with tastes of Bultarra lamb, puddings, brownies, Jalna yoghurt, or vincotto from Enoteca Sileno. But what of those signature dishes? I gave careful consideration to the menu, ensuring I picked from restaurants that were of interest, but perhaps in a price bracket that made an imminent visit unlikely. First up was a dish from the Botanical, which had grabbed my attention from the moment I perused the dishes on offer: Macleay Valley rabbit and chorizo terrine with quince aioli. It's those two words at the end that turn my head. As with several of the dishes on offer, the presentation wasn't going to win any prizes for aesthetics - paper plates don't help, and these were 'sample size', so morsels, smears and smidgins were the order of the day! 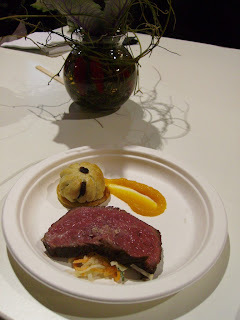 Secondly was an intriguing mix from Circa, the Prince: slow-cooked sher wagyu, braised meat pie, truffled coleslaw and licorice-spiced pumpkin. This plate served up more than a morsel of meat. The too-cute pumpkin pie was only ever-so-slightly tinged with the licorice spice, but just as well since there was also the unmistakable kapow of truffle in the coleslaw, and all that nutty fattiness in the wagyu. Something I was quite pleased to eat such a delicate amount of, giving its constituent parts. Lastly, I was thrilled to be able to try Interlude's bacon and eggs. Your first thought is understandable - that bowl of darkish liquid looks more like miso than a breakfast fry up. This is true. What this version of bacon and eggs actually involves is an egg baked in its shell for hours at 63C. When it comes out it has a silky texture and a still-runny yolk. 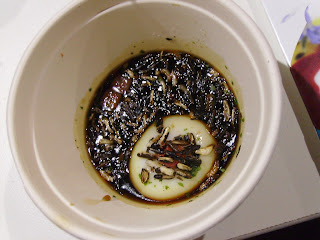 The egg sits in a consomme with dehydrated pancetta and puffed wild rice. It is certainly a texture journey as much as a flavour trip.